Screwpine which is commonly known as pandan leaves, and is used widely in Southeast Asian cooking as a flavoring. 1. Preheat oven at 160°C fan forced/180°C regular. 2. Beat egg whites and cream of tartar with an electric mixer till soft peaks. Add 50g sugar one tablespoon at a time a beat thoroughly after each addition till you achieve stiff peaks. Set aside. 3. In a separate bowl whisk egg yolks with 50g caster sugar till fluffy with hand. Add vegetable oil, pandan juice and all purpose flour + baking powder and whisk until combined. Gently fold the egg whites into the yolk mixture in 3 batches. 4. Pour into the mixture into cupcake case and into muffin pan. Bake for about 15 minutes, or till skewer comes out clean. Remove pan from oven and allow cupcakes to cool in pan for about five minutes. 5. 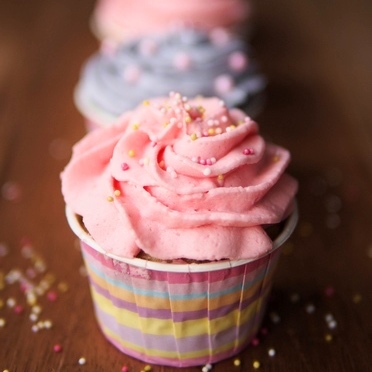 Remove cupcakes from pan and place them on a wire rack to cool completely. 1. n a stand mixer fitted with the paddle attachment, cream the butter on medium speed until it is very light in texture, 2 minutes. 2. Add the icing sugar, vanilla extract, lemon juice and salt and mix on a low speed until the sugar and butter are blended, scraping down the bowl with a rubber spatula as needed. 3. Increase the speed to medium and, with the mixer running, add the cream in a thin stream. 4. Increase the speed to high and whip the buttercream until very smooth, light, and a good spreading consistency. Adjust the consistency if necessary by adding a bit more icing sugar or cream. 5. 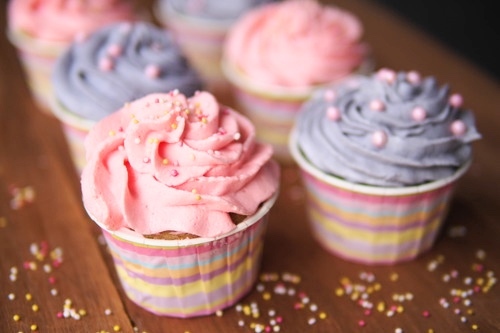 Put half of the icing into another bowl and colour it pale pink with the edible colouring. Colour another one with violet edible colouring. 6. Icing the cupcake to the design you like.